The NEW Common Application Prompt 4: What’s Your Problem? You almost can’t go wrong if you pick this prompt to write your college application essay for The Common Application for 2015-16. It sets you up perfectly to tell an engaging story, which makes the best personal statement-style essays. If you read through the lines, this prompt breaks down to a simple formula: Find a problem you faced or are still facing, share what you have done to deal with it, and then go on to explain what you learned in the process and why it mattered. That’s it! The authors of this prompt try to help you by offering sample problems you could write about: an intellectual challenge, a research query, an ethical dilemma. But these are just some suggestions. Their main point is that your problem can be “anything” that mattered to you. Also, when they say, “no matter the scale,” the message is that this problem can be big or small. In other words, it doesn’t have to have been a catastrophic life event. But if you did face a crisis in your life, this could make an excellent essay, too. You get to pick. The beauty of this prompt is that if you write about a problem, you almost can’t help include some type of story. Think back to English class. Remember the two things you need to make a story? A character and a conflict. In these essays, since you write about yourself, you are the “character.” And the “conflict” is the problem you faced or are facing. To put it simply, a conflict is just another word for a problem. Problems come in all forms. They do not need to be traumas or a crises, although those can work, too. (HINT: Basic, everyday problems work best! Check out this post about “mundane” topics.) Here are other words for a conflict or problem: challenge, failure, obstacle, mistake, hang-up, issue, a change, dilemma, fears, obsessions, accident, a deficiency, query, etc. Some variations of problems: you are shy, competitive, stubborn, were bullied, are obsessed with Twilight, didn’t make the team, got injured, have big feet, frizzy red hair, smile too much, someone quit at your work, don’t have own car, can’t spell, adhd, ocd, don’t eat meat, perfectionist, slob, lazy, drunk driving, have a mean grandparent, no money, etc…Man, there are a lot of problems out there! But for the purposes of writing these dreaded essays, that’s a good thing for once! 1. Describe the time you had a problem or describe a specific example of your problem. Include what happened and how it made you feel. Try to start at the moment it hit, or happened for the best impact. Include the 5Ws–-who, what, when, where and why! Stick to one or two paragraphs. Include a snippet of dialogue. These mini-stories from real life are also called anecdotes, and you can learn more by reading my post on how to write an anecdote. 5. What did you learn from dealing with that problem–about yourself, others or life in general? Anything good come out of it? Did you develop or demonstrate a core quality–determination, problem-solving, creativity, passion, patience, respect…–in the process? Talk about that. This is your chance to develop more “its significance to you” in your essay. 6. To wrap it up, update the reader on the current status of that initial problem you shared in the introduction. You don’t necessarily have had to solve it. Just explain briefly how things are going for you now, today. You could also give examples of how you have applied the life lesson(s) you learned in other parts of your life. 7. End by projecting into your future. Go ahead and share your goals and dreams as they relate to what you have learned about yourself. If you can think of one, end with a “kicker,” which is a memorable last line that can show that you are witty, funny, passionate or don’t take yourself too seriously. 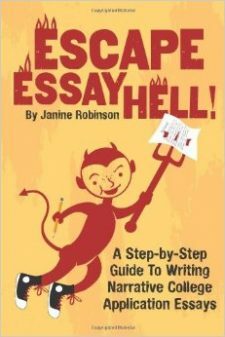 This is just a sample outline for a classic narrative-style essay to help you get started. You don’t need to stick to every step, and feel free to take your essay in whatever direction you want. Just remember that the point is to reveal how you think, what you care about and how your learn. It’s called your “intellectual vitality,” and colleges love to see it in all shapes and sizes. Although this post with three sample essays was intended to help students write their University of California essays, all three sample essays could easily have answered one of the five Common App prompts. Notice how the introduction to each of these essays describes a problem, and check out how the students used an anecdote to help the reader understand it. Instead of explaining their “problem,” they used a moment or an example from real-life to help us see it for ourselves. The first sample essay, by Duncan, shows us how people think he’s mean, because he’s such a big guy. The first paragraph is an example of that problem. The second sample essay, by Gabrielle, shows us a moment of her weekly drive between her parent’s two homes. The first paragraph is a specific example of her problem: the long boring drive, and the reason she has to endure it: having divorced parents. The third sample essay, by Luc, shows us the moment his house literally fell out from under him in a mudslide. His first paragraphs describe that moment and his problem: losing his home. All these essays engage the reader at the start because something happens. Problems are good for that. And they go on to share the steps they took to deal with them, and how they felt, and what they learned. You can do this, too! Prompt 1. Some students have a background or story or interest or talent that is so central to their identity that they believe their application would be incomplete without it. If this sounds like you, then please share your story. Prompt 2. The lessons we take from failure can be fundamental to later success. Recount an incident or time when you experienced failure. How did it affect you, and what lessons did you learn? Prompt 3. Reflect on a time when you challenged a belief or idea. What prompted you to act? Would you make the same decision again? Prompt 4. Describe a problem you’ve solved or a problem you’d like to solve. It can be an intellectual challenge, a research query, an ethical dilemma-anything that is of personal importance, no matter the scale. Explain its significance to you and what steps you took or could be taken to identify a solution. Prompt 5. Discuss an accomplishment or event, formal or informal, that marked your transition from childhood to adulthood within your culture, community, or family. How Many Common Application Essays Should You Write? Just How Creative Should You Get? Do you think writing about how I am still overcoming an anxiety problem a good topic for the problem essay? I have written some of it and I feel that this problem is very important to me. could i write about a problem that i’m not facing personally, but would like to solve? I am frantically searching some topics and college essays problems are universal all over the world to students like us..I am from India and facing it.. trying to be motivated reading guides from authority sites.